Charles Harmony Harrison was born in a squalid and over-crowded Yarmouth alley known as Row 33 in January 1842. Natural history became his favourite subject at school, while sketches made during youthful trips to Bradwell, Burgh Castle and Caister displayed yearning affection as well as natural flair. As he had to help with the family income, Charles Harmony Harrison was apprenticed as a sign-writer in the Row 45 workshop of Mr platt where he developed his colour sense and learned a great deal about mixing and applying paints. In his spare time he completed his education by reading, visiting exhibitions and studying the methods of Cotman and Crome. If art was an unlikely escape route for a working-class lad, the army was a well-trodden path to adventure. And in 1859 – seeming to despair of painting -Harrison joined the Yarmouth Artillery Volunteers and later the Rifle Volunteers. 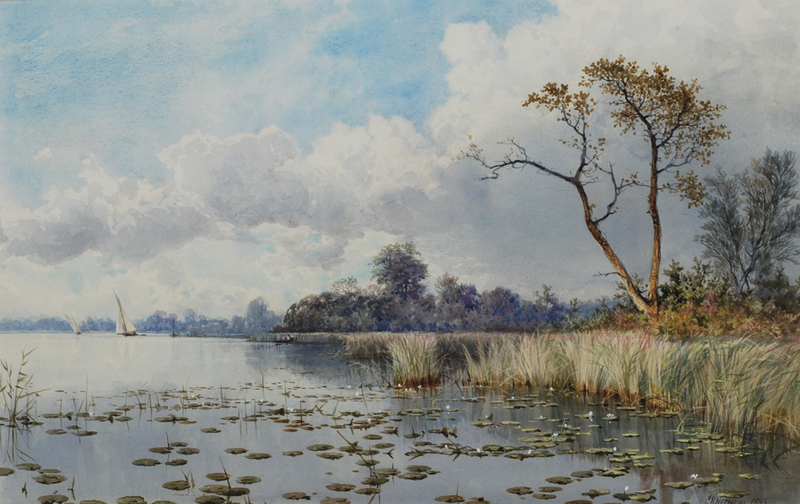 In 1870 however, Harrison’s artistic ambitions were revived when a relative employed on an East Indiaman gave him a box of watercolours which had been left behind by a lady passenger. He had found his medium. Now with his land and seascapes rapidly attracting the attention of local art patrons and commissions resulting, the budding artist was persuaded to embark on a professional career. After the death of his first wife in 1877, he married again and then moved to London, hoping to perfect his painting and seek professional advice on the sale of his work. But in barely a year he returned: Charles Harmony Harrison had hated the capital and had probably destroyed most of his work completed there. Henceforward he shunned the major galleries. Norfolk formed his entire focus and when, in 1880, a deep friendship developed with Stephen Batchelder the most productive phase of his life began.